Our goal, fabricating a true 5200 bottom on Shirley’s and my 1953 22’ Shepherd Sportsman, obliterated another milestone today, or I should say, John obliterated it. When I arrived here way too early this morning, John was already well into patterning, and once again quietly demonstrating his never-ending resourcefulness and creativity, but let’s allow John to speak for himself on the clip. Enjoy! favorite finishing tools, a monster Makita belt sander and our 48” horizontal belt sander. By lunch the starboard side was behind him and I was hard at applying multiple coats of CPES to the edges and both sides of all four panels. I notice that John seemed uncharacteristically tense as he dragged his patterns to the port side of the bottom. If the boat is straight and true, he should be able to flop them down and enjoy watching them fall into place, fitting perfectly. His smile told the story. They did and do fit perfectly on either side. Our painstaking, and oft-times incredibly tedious work, first on the keel and then the frames, doing all we could to regain a true hull, something that was lost to her years of hanging from her lifting eyes with water up to her chines all summer, every summer. By the end of the day, all eight panels have been liberally CPES’d. 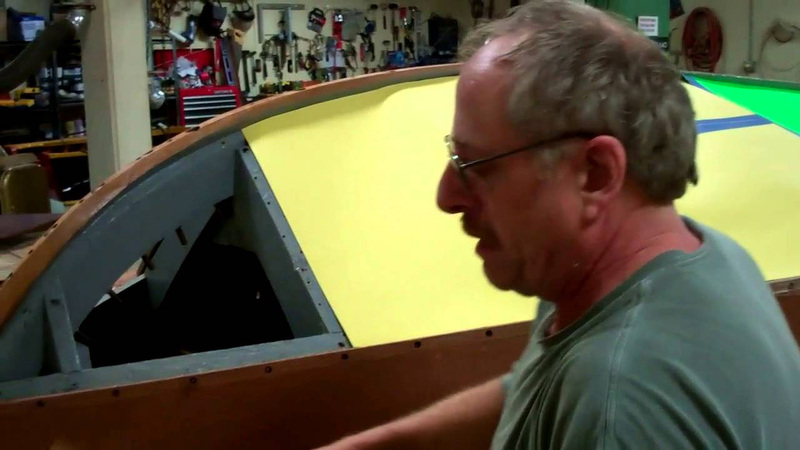 Tomorrow we will begin scribing lines needed to locate each rib, and begin also installing the between-rib battens – think of a Chris-Craft hull – Shepherd expert, Phil Jones of Lynchburg, VA, urged that we do. These battens, together with the thicker ribs will render the bottom as stiff as she can be, and fully prepared for anything the dual-quad-four Hemi 331 delivers.